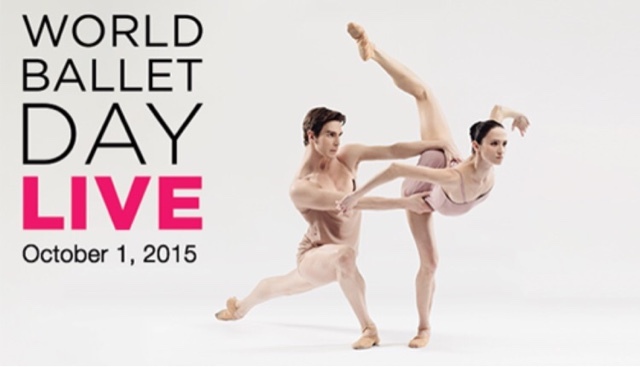 The 2nd Annual World Ballet Day has come and gone! I wish it lasted longer than just a day! Like many other dancers and fans I COULD NOT GET ENOUGH! This is the second year that they have done a live streaming of 5-6 major companies across the world. World Ballet Day was born out of Royal Ballet Live, a nine-hour live stream on YouTube and The Guardian website in March of 2012. The event achieved 200,000 views of the live stream and repeat broadcast and over 2.5 million views on YouTube to date. Here is a video of inside class at the Royal Ballet from 2012 Royal Ballet Live. 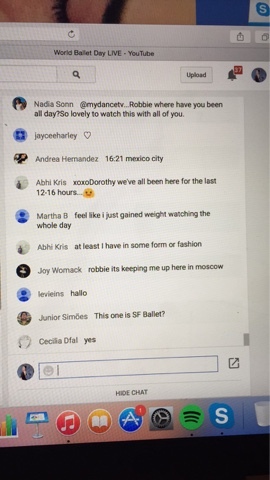 The companies live streamed for 2015 were, The Australian Ballet, The Bolshoi Ballet, The Royal Ballet, National Ballet of Canada, and San Francisco Ballet. This year they also featured smaller segments of other top ballet companies such as ABT, Houston Ballet, Boston ballet, and many others. That’s 23 hours of ballet, ballet, BALLET! More than half a million people watched last year’s live stream. If you loved the behind the scenes, rehearsals, live classes and interviews be sure to mark your calendar for next year! If you missed the live streams a link to watch archives is at end of blog. 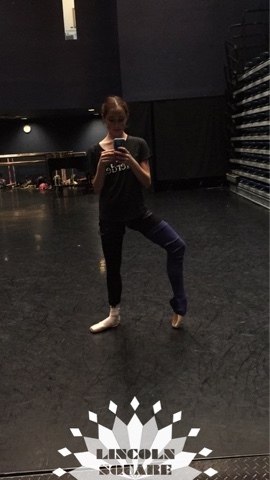 For me, World Ballet Day started at around 10 pm on September 30. I watched some of the Australian Ballet’s company class before I went to sleep. I also started live tweeting (@BalletBabble) and posting on my public snap chat. 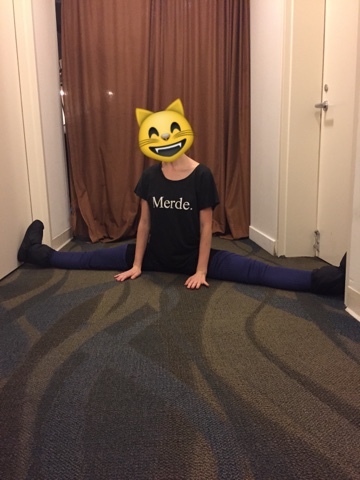 (@theballetbabble). This kept me up until around midnight, it was so good I just couldn’t stop watching! I wish I could have stayed up to watch the Bolshoi rehearse but I had classes the next day. When I woke up in the morning I turned on the lifestream to watch The Royal Ballet rehearse. SO GOOD!!!! I absolutely love The Royal Ballet and it is so amazing to be able to watch them rehearse in the studios. I continued to get ready for a day of classes as I watched the live stream. Once I arrived to the studios I updated on snapchat and twitter. I continued these updates throughout the day. National Ballet of Canada Artists in rehearsal. Photo by Karolina Kuras. After classes I headed back to the dorms and turned on the live stream on my computer. The wifi was being difficult so I had to use my hotspot. My roommate and I were able to watch San Francisco Ballet rehearse Giselle! We saw Yuan Yuan Tan and Tiit rehearse the second act. I also spotted Sasha de Sola in the Corps de Ballet. They then ran a second cast with Mathilde Froustey as Giselle. I love how World Ballet Day gives people everywhere a chance to see what it takes to be a dancer and to be in a professional company. I hope it inspires people to take ballet, stay in ballet or go to the ballet! 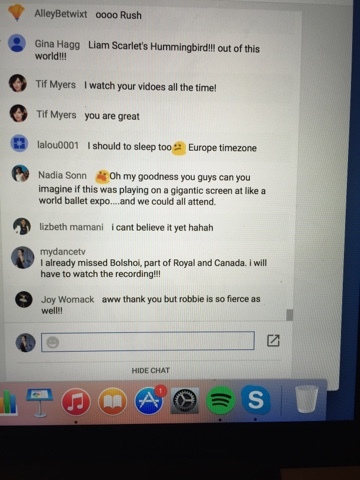 On the side of the live stream (on youtube) there was a live chat box where you could send comments. Whoever was watching the lifestream could see those comments. I commented something and then Joy Womack responded to it! Also some people who follow my Youtube page also said hello! 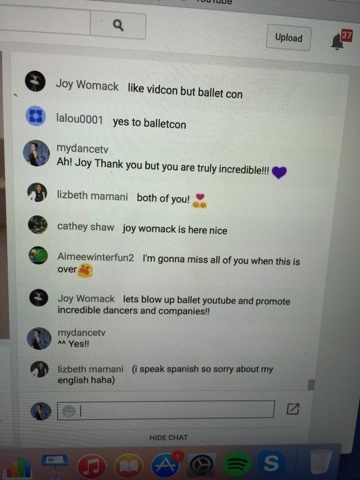 It was so cool to talk with Joy and others! I had so much fun! I wish World Ballet Day would last so much longer. Good thing we can watch the recorded version of it on Youtube. I believe there is still footage from last year as well. Here is where you can watch the recording of the Live Stream!!!! Thanks for reading and be sure to watch next year! Join My Facebook Event !